The Elstead Aegean hand-forged polished nickel 2 lamp wall light, with a circular wall mount, two scrolled curved arms and lower barley twist finial. 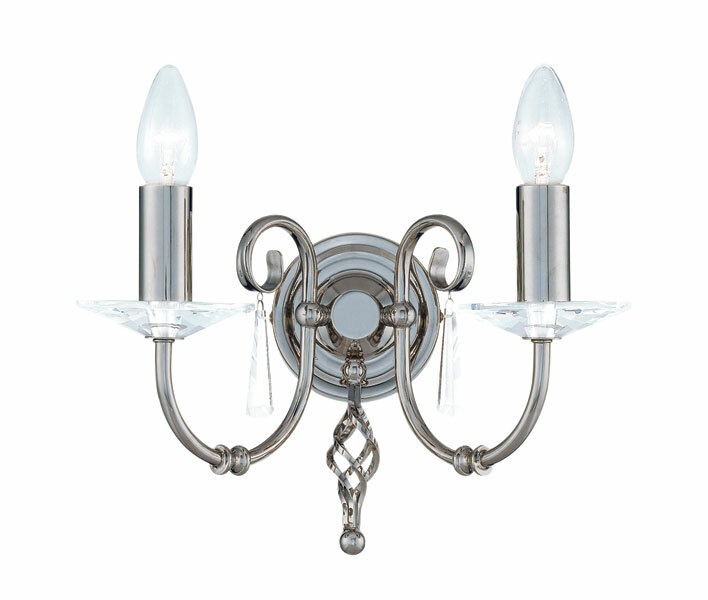 The arms are decorated with glass sconces, two heavy cut-glass drops and polished nickel candle tubes. The stylish Aegean lighting suite features hand forged scrolls accented by cut glass droplets and sconces. Comprising of two wall and three dual mount flush convertible ceiling lights, the Aegean light fittings will add style to both contemporary and classical settings. Get the best of both worlds with this stunning polished nickel lighting range that will look as good in both contemporary and traditional settings. Part of the Aegean luxury lighting range from Elstead Lighting.